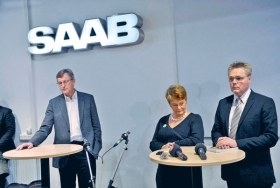 Facing reporters in Sweden Friday to discuss Saab's demise: from left, Saab Managing Director Jan Ake Jonsson; Maud Olofsson, Sweden's deputy prime minister; and Joran Hagglund, secretary at Sweden's Enterprise Ministry. Michael Simon, newly installed as general manager of a stand-alone Saab store under new ownership, kept pushing sales right up until the death sentence was delivered. He held a three-day sale at the end of November. Although General Motors Co.'s deal to sell Saab to Sweden's Koenigsegg Group AB fell through that week, his Saab of Downers Grove in suburban Chicago, still sold 35 new cars. Undeterred, Simon bought more new Saabs from less-hopeful dealers and planned another sale. He ran a full-page ad in the Chicago Tribune on Friday, Dec. 18. But that same day, GM said the Saab sale to a second prospective buyer -- Dutch niche automaker Spyker Cars NV -- was off, and its 218 U.S. franchises would wind down. Simon's crushed hopes are typical of Saab lovers. 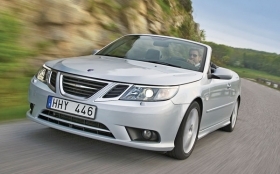 Saab had a great product, dealers say, but it has been doomed to fail for years. Now GM will start winding the brand down in January, satisfying its debts, honoring its warranties and gradually moving service customers to surviving GM dealerships. GM didn't say how long the process will take. GM said in 1989 it would take control of Saab. But since then the brand has never matched its U.S. sales high of 48,181 units, reached in 1986. Its meager 7,812 sales this year through November were down 61 percent from 2008. "The automotive business is about new product and marketing and pricing," said Cathi Maier, general manager of JMK Saab in Springfield, N.J. "In order to stay competitive, you need that." Neil Patrick, a 30-year Saab dealer in Auburn, Mass., first started working at a Saab store in 1970, long before GM got involved. "They've kind of ruined the franchise," Patrick said. "They improved product mechanically, and the reliability factor, but they just didn't market the brand." Saab dealers signed an agreement this year that said the brand and its stores would close if a sale fell through and GM could not find another buyer. That agreement said GM would pay them for their service-customer list, which the automaker would use to direct Saab customers to nearby GM dealerships. Dealers received a quarter of that payment at the time -- $300,000 for Patrick -- with a promise of getting the rest if the brand died. Patrick's store was drawing most of its Saab-related profits from service and parts. He also sells Subarus and Volkswagens and doesn't plan to lay off any staff when Saab drops out of his lineup. He has 17 new Saabs left, down from 50 six months ago, because of his efforts to lessen his Saab exposure. "Everyone was kind of geared for it, to be truthful," he said. "I didn't give it much hope after the first guy didn't buy it." Maier's store in Springfield, N.J., is a stand-alone outlet, although JMK has a BMW dealership 1,000 feet away. Her store has 32 new Saabs left, and the management is trying to decide on a Plan B. They're considering focusing on used sales and bringing in a new franchise. But Maier says she's still a little numb. She says her store topped GM's Northeast region in Saab sales for the last 11 years. And while the dealership hasn't been profitable in a while, she says she still believed in Saab's product. "We put these stores up with the promise of hope," she said of stand-alone Saab dealers. For Simon, the work has just begun. The store, which has about 20 new Saabs left, is about 5 years old, has 12 service bays and fits eight cars in its showroom. But its location, on popular Ogden Avenue in Downers Grove, has turned from a boon to a curse. So many other dealerships are on that strip that Simon is afraid none of his desired import brands can choose his location without violating agreements with other dealers. And the owners who bought his suburban Chicago Saab store in July need to find another new franchise to make money on their $10 million investment. "Our business plan is going to have to be remodeled at this point -- you know, no franchise," said Simon, in between cell phone jingles. "We've started to do some research and put some feelers out there as to what might be available."